Migos' Quavo and Takeoff (their third, Offset, is being held at Bulloch County Jail in Georgia following his April arrest) joined a nine-piece classical orchestra commissioned by music streaming service Audiomack to perform a "Trap Symphony." Their performance of "Hannah Montana" premieres exclusively today on The FADER and is the first video from a three song suite that will be released soon. Though it seems many of the players were unfamiliar with them—one of the orchestra members deemed the track "pretty nice with the bells"—the Migos are very excited about the result of this experimental performance. "This was a dope concept," the Migos told The FADER in an email. "We been influenced by all different types of music. 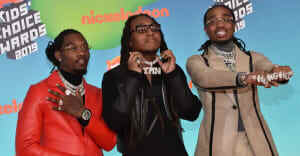 People think of Migos and think of one type of music, but we gonna do it all." Does this mean they will be trading Zaytoven for Beethoven on their debut album, Yung Rich Nation? Probably not; but we'll know for sure when it arrives next Friday, July 31. Secure your copy of the album here and purchase tickets for the release show, at the Highline Ballroom in New York, here. Read more about Audiomack, the streaming service playing major league ball with major league talent.